The best way to get sauce to stick? Toss hot pasta with hot sauce quickly, as soon as it’s done. And don’t rinse the pasta. It comes back to a boil faster when you add the pasta; it makes it easier to submerge long, rigid pastas like spaghetti; and it helps to reduce sticking slightly by quickly washing away the exuding starch from the pasta surface. You really don’t have to use that much water, especially if you’re cooking less than half a pound. But, as I’ve found, the end result is a bit gummy. Stir during the first minute or two of cooking. This is the crucial time when the pasta surface is coated with sticky, glue-like starch. If you don’t stir, pieces of pasta that are touching one another literally cook together. Salting after the water comes to a boil is recommended to prevent the salt from settling to the bottom and corroding the pot if it’s added to cold water at the beginning. Pasta that’s cooked in oily water will become oily itself and, as a result, the sauce slides off, doesn’t get absorbed, and you have flavorless pasta. 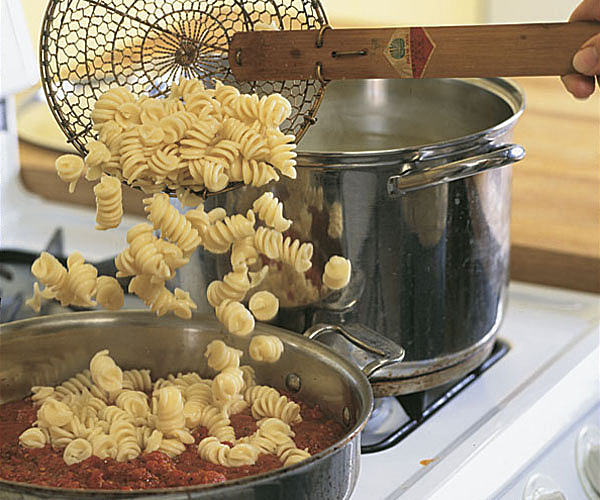 Toss hot pasta with hot sauce quickly — without rinsing it — so the pasta absorbs more sauce and flavor. As it cools, the swollen starch in the pasta crystallizes and becomes insoluble, and the pasta won’t absorb as much sauce. There’s that resistant starch I talk so much about. Resistant starch bypasses our digestion and ends up in the colon where bacteria feed upon it, and release good things like biotin, vitamin K, and short chain fatty acids. We don’t absorb calories from resistant starch (except the few that bacteria provide us). That’s another reason why I don’t like calorie tables. Another reason not to rinse – bits of starch stuck to the surface of the pasta helps to thicken the sauce. Every once in a while I like to reevaluate what I’m doing. I can get stuck doing something by habit and forget why I’m doing it in the first place. Two things this emphasizes for me, use enough water and don’t forget to salt. This entry was posted in Uncategorized on January 1, 2016 by Bix. That word “properly’ in their title … It seems like such a throwback word.